The C-1 Trader grew out of a need by the United States Navy (USN) for a new anti submarine airplane. In response to this Grumman began development on a prototype twin-engine, high-wing aircraft which it designated the G-89. 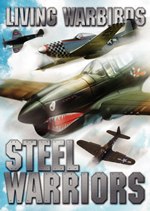 In 1952 the USN designated this aircraft the XS2F-1 and flew it for the first time on December 4 that year. 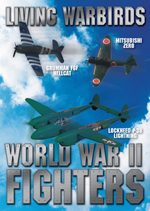 During the rest of the 1950s three major variants emerged, the C-1 Trader being one of them. The C-1 (originally the TF-1) was outfitted to carry nine passengers or 3,500 pounds (1,600 kg) of cargo and first flew in January 1955. Throughout the 1960s and 1970s the C-1 Trader carried mail and supplies to aircraft carriers on station in the Pacific Ocean during the Vietnam War and also served as a trainer for all-weather carrier operations. Over its production life 83 C-1 Traders were built, of which four were converted into EC-1A Tracer electronic countermeasures aircraft. 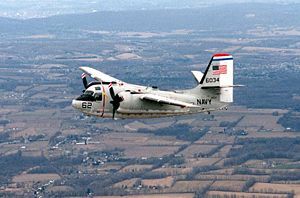 The last C-1 was retired from USN service in 1988; approximately ten are still airworthy in civil hands, operated as warbirds. In August 2010, Brazilian Naval Aviation announced that it will buy and modernized eight C-1 to served in the carrier onboard delivery (COD) and aerial refueling roles for use on its aircraft carrier Sx�o Paulo. 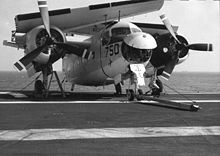 Carrier Onboard Delivery version of the S-2 Tracker with enlarged fuselage for 9 passengers, redesignated C-1A in 1962, 87 built. Electronic Countermeasures conversion of the TF-1, redesignated EC-1A in 1962, four conversions. Airborne Early Warning project that was developed in the WF-2 Tracer. Grumman C-1 Trader Pictures and Grumman C-1 Trader for Sale.